Some of the earliest examples of Indian trade textiles, from the Dead Sea area and Egypt, have been dated to the ninth and tenth centuries, though there is evidence that points to a thriving trade in Indian textiles to far flung regions such as the Middle East, Rome and Southeast Asia as early as the first century AD. Overland and sea trade was clearly well established to and from India way before the Renaissance which saw the opening up of the whole world to European shipping. Evidence of this international trade can be found in diverse sources such as paintings and writings. The first century AD Greek Periplus of the Erythraean Sea mentions Indian trade textiles as does Pliny. The fifth and sixth century Ajanta Ellora cave paintings in central India depict gatherings of people from all nations listening to Buddha's sermons, some wearing textiles of Indian origin. Several Chinese pilgrims commented on the variety of people who made it through the courts of Indian kings who were insatiable in their quest for information of other lands and people. The most convincing proof, however, of the extreme exchange between nations is surely to be found in Southeast Asia, where the region was dominated by Hindu thought and custom in the fifth and sixth century AD. Even today, the legacy of this close contact exists in the customs and traditions in that part of the world. One need look no further than national symbols: Rama in Thailand, Apsara in Cambodia, Garuda in Indonesia, Singa in Singapore and so forth, all of Indian origin, to assess the extent of influence Hindu culture had on the region. It is worthwhile to note that Indian influence spread not through conquest or colonization, but through exchange of ideas, traditions, religion and possibly trade textiles. Indian traders were happy to trade for profit and looked upon their journeys eastwards as six-month long adventures on monsoon winds. The fact that traders spent so much time at Indonesian ports, just waiting for the winds to change, meant that the people at those ports were exposed to the wealth of Indian culture which was highly developed at the time. Thus the traders exported not only goods but custom, religion, ritual and language to Indonesia along with their precious cargoes of textiles. This new culture was charismatic, even hypnotic to the people of Southeast Asia, and was absorbed by them through a process of osmosis. Textiles were just the tangible manifestation of the traders' refined culture and naturally assumed spiritual rank and meaning, much more so than they had enjoyed in their country of origin. This probably explains the Southeast appetite for Indian ornamentation and decorative styles and in turn, the flawless interpretation of Southeast Asian esthetic parameters by Indian craftsmen which made Indian products fashionably durable for centuries. Textiles made for an ideal cargo, portable, light, and easily packed; they were at the heart of barter societies for centuries. It is difficult to say with any accuracy when the first ships brought Indian textiles to Indonesia, however, with such a long and successful early history of trade in textiles to the western markets of the Middle East, Greece and Rome, it is prudent to assume that the first traders carried a similar cargo of textiles to Indonesia to trade for gold, precious woods and spices. Indian traders set up guilds on Indonesian soil, close to port cities, to distribute the goods brought by the seamen on their six monthly voyages. Barter was already a common practice established between the exporters and importers, and later western merchants simply adopted this system, one leg of which involved Indian textiles and the other Malay gold and spices. The sea trade dominated by Gujarati merchants linked the port cities of the Middle East to those of Southeast Asia through the medium of trade textiles, long before the islands became an important destination for the traders of Europe as a source of precious spices. This barter trade between India and Indonesia expanded to include Europe, becoming the palimpsest for world history, which played out in a much larger, public international arena against the parochial backdrop of the textiles for spices trade. The delicate balance of power and indeed the history of the world, changed when the European nations: Britain, Portugal and Holland, not content to trade for profit alone, wanted to control the source of spices. It was the dawn of the age of colonization, and trading became an instrument of colonization with huge impact on global politics. We can trace some of this history through the Indian trade cloths that have been found on Indonesian soil. Today, very few pre-fourteenth century cloths survive, but thanks to the Dutch trading company the VOC that made generous and detailed mentions Indian trade textiles we are able to trace much of the provenance of post-sixteenth century cloths and assess the impact they had on the history and fortunes of this region. In 1619, the VOC Dutch trading company moved its headquarters to Batavia (modern-day Jakarta). The VOC was quick to recognize the importance of Indian textiles in Indonesia. They forcibly captured much of the Gujarat Patola and the Gujarati cotton cloth trade, prohibiting private dealing and displacing Indian factors and agents who had bases on Indonesian soil. 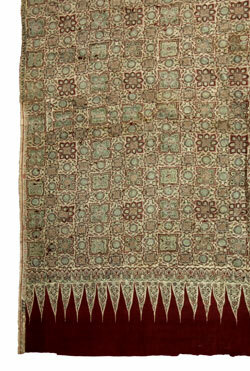 The VOC was itself a huge buyer and secondary barter partner in the trade of Indian textiles. They would order vast quantities of Indian trade cloths to secure allegiance of particular rulers or spice rights. The company prohibited the trading of non 'VOC' textiles in important spice-growing islands such as Solor, Maluku and Makassar in South Sulawesi. So important were Indian textiles in the economic and social life of the Indonesian people that wars were fought to ensure the embargo was maintain, no small wonder as all diplomatic ties were cemented through the exchange of valuable Indian textiles in the custom of the day. At one time, the VOC had over a million Indian trade textiles in its possessions at its warehouses in Batavia! To ensure that the embargo on free sale of textiles was not breached, the VOC introduced a system of stamping. Many textiles have been found displaying the VOC stamp together with the local stamp of the manufacturer in India. Bulk of the textiles sold and traded in java moved through the hands of the VOC, stamped and re-stamped before sale and taxed appropriately. However, there were a significant number of textiles that were traded directly in spice-rich areas possibly by the Gujarati merchants themselves. Several important unstamped textiles have emerged in places like Toraja, Central Sulawesi and in East Nusa Tengarra including Solor, Savu and Roti. The packing and sale lists of the VOC provide much of our information on the types, quantity and value of textiles traded in Indonesia from the seventeenth to the twentieth century. Written descriptions left by several Dutch officials also testify to the huge impact that Indian trade textiles had on the fortunes of the people in power  the Dutch and the Sultans  during that time. Cotton was being grown in India as early as 3000 B.C. Indians had a supreme grasp of weaving and dyeing processes from the time of the Indus valley civilization. It is hardly surprising then that Indian textiles were highly developed in terms of complexity and fineness of weave and strength and variety of color. Cotton was produced at home, but the earliest and most valued silks were woven with Chinese silk thread obtained through trade. Dyeing in particular set Indian cloth apart from that produced anywhere else in the world. Indian craftsmen had a complex knowledge of processes and color sources and guarded both keenly to maintain their monopoly over some types of export textile markets for hundreds of years. Even today one can read the proud claim 'the cloth may wear out, but never the color fade' displayed above the Patola weavers' homes in Patan Gujarat. Indian trade cloths were dominated by the colors red, blue and black. All the sources for these colors existed on Indian soil in the form of plants and minerals and those that didn't were brought in by the traders from Africa, the Middle East and Spain. The intensity and hue of the dyes differed from region to region, determined by the soil and water composition found there. The blues and black colors were indigo based, the depth of color depending on the number of times the cloth was dyed. Indian indigo, particularly from the region of Gujarat, was exceptional and freely traded in the form of dry blocks. Local reds were obtained from chay and the madder plants. The chay used in Southern India was considered a superior product because it was very bright and color fast. An imported red was obtained from the barnacle Cochineal that grew in the Mediterranean Sea. Cochineal was an important dye for the Patola weavers of Patan. The Indian dyers had a very good grasp of mordants and combined mordants and dyes to achieve very fast colors that withstood even repeat washings. 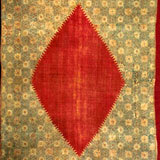 Some of the earliest and most valuable cloths were the Patola dye-resist double-ikat silk cloths from Patan Gujarat. At the helm of the textile trade, Gujarati merchants naturally exported that cloth which commanded the highest prices at home. Patolas are complex cloths requiring months to weave. With an intricate knowledge of dyeing the Gujarati weavers managed to create some of the most extraordinary cloths through a process of ikat weaving which involved the precise dyeing of both the weft and warp thread systems. These extraordinary cloths have maintained their value right into modern times and the techniques and processes associated with Patola weaving are secret to this day. It should be noted that some of the more valuable cloths like the Patan Patolas, expensive and coveted even in India, that were brought to Indonesia for the purposes of trade were not of the highest quality weave, such as that sold in India. This fact clearly implies that the Patolas the traders brought to Indonesia were woven expressly for the overseas market, perhaps for fulfill explicit orders. By the time the Dutch arrived in Indonesia, Patola textiles had become synonymous with status and spiritual power and hence authority. The right to own and wear Patola rested with the nobility, and being able to own or wear a Patola gave a family instant status. The designs and lengths that were exported to Indonesia were very specific and do not occur in the corresponding Indian inventory. However, the designs clearly conform to Indian aesthetic parameters and depict commonplace Indian themes rather than Indonesian ones. Hence it is likely that Indian weavers created specific styles and patterns exclusively for the Indonesian market, in turn establishing strict parameters for the exported Patola's spiritual language. Even a slight deviation from the established patterns meant that the cloths would not be accepted by Indonesian buyers. The Patola's that made their way to Indonesia were decorated with Animal motifs and geometrical patterns. The most common of the animal motifs were the tiger and elephant repeat patterns. The more exclusive patterns were the ones with the caparisoned elephants, the fewer the elephants and the less-repetitive the pattern the more valuable the cloth. These cloths were used to barter for items of great value such as land rights. All the animal Patolas were display textiles, used in two plus meter lengths as a backdrop for the royal throne. The geometric patterns were mostly based on nature the most common ones are the eight point jasmine flower and a trellis flower pattern. The geometric Patolas have been found in longer lengths, and were used as turbans and waist sashes for nobility as depicted in royal paintings and aquatints by Dutch artists. Another category of Patola was exported to Indonesia most probably at a much later time. These Patola cloths were stitched into trousers, sashes and head dresses for nobility. The patterns on these cloths are exactly similar to those found in Indian Patola and the high quality of weaving also suggests that these cloths were made for the Indian market and then converted into articles of royal clothing either in India or after shipment in Indonesia. When the prices of Patola and the appetite for such cloths increased, cotton imitations, also made in India, began to appear on the market mostly for use as shoulder cloths by the laity. Other cloths exported to Indonesia since the earliest times were the coarse cotton cloths from Cambay. The typical patterns were simple repeat patterns of floral block-printed designs and cheap checked cloths that came to be commonly known as Cambay cloths. The dyeing techniques consisted of mordant and resist dyeing and the rare hand painting. They were sent to Indonesia in bolts, to be cut to the required length for the buyer. Most cloths had no edges to signify the natural length of the cloth, though a few like the hamsa, the sacred goose pattern did have edges along the widths where they were to be cut. These cottons were used both as attire and wall hangings. Who dictated the patterns of Indian trade cloths is an issue for debate, though evidence points strongly in favor of Indian pattern makers, because the cloths that have been found at best interpret common Indian stylistic themes in an Indonesian aesthetic style, rather than depicting Indonesian themes. Some of the patterns on cotton cloths are unchanged from the ninth century fragments found in the Fustat excavations in Egypt. Therefore, it stands to reason that since similarly patterned cloths were being shipped to entirely different markets, the patterns must have originated in India. Many of the patterns themselves can be traced to copies of stone screens and trellises, and hybrid Hindu-Moslem patterns that were perfected by the fourteenth century. Another totally different category of Cambay cloths found in Indonesia were the figurative block-printed cottons depicting dancing girls holding parrots and dressed in the rich attire of court dancers and hunting scenes depicting elephants and warriors on horseback. The paintings include many Indian symbols associated with such types of depictions, such as sacred geese, umbrellas, fly whisks and musicians. The block-printed pictures on most the seventeenth century cloths are very similar to the in the style of Jain miniature paintings of the time, while some of the earlier fourteenth century finds are more in the style of the Ajanta and Ellora cave paintings. These cloths found predominantly in Toraja, Central Sulawesi were most probably clan cloths used as ceremonial hangings by tribal chiefs. Some of these cloths were singed, while others were inscripted. Ceremonial hunting scenes in the Rajasthani style of painting, produced to this day for special festivals, have also been found in Toraja and some stylized version in Timor. The Rajasthani hunting scene cloths differ from those depicting dancers and hunting scenes of Gujarati influence in as much as they were probably not explicitly produced for the Indonesian market like the latter. Concurrently in the trade history, Bengal muslins too found their way to Indonesia for use as turbans. The cloths were predominantly white, but it was their high quality and fineness of weave which set in a class of their own. Most of what we know of Bengali muslins comes from written descriptions of Chinese and Dutch travelers. In the late sixteen-hundreds Golconda and Masulipatam along the eastern Coromandel Coast emerged as important centers of cotton exports, which were much more refined than their western precursors. Masulipatam had very close ties with Persia, gaining from the transfer of technology in the process of patterning and dyeing from Iran and other Islamic countries. The Coromandel cloths were known by several names, Chintz, Kalamkari and Kling cloths, in the Indonesian language the nineteenth century shoulder cloths found in Sumatra came to be called Kain Sembagi and Kain Lahore. The term chintz, derived from the Hindi cheent meaning a spray of drops was used equally for painted and printed cloths. The chintz of Coromandel became famous for its fine detail, sweet delicate patterns, and durability of dyes. The term Kalamkari (from the Persian word kalam meaning pen), meaning literally 'penmanship' was used because the Coromandel cloths were often patterned using bamboo quills and pens. The word Kling was term applied to traders from the northern Coromandel Coast, the erstwhile Buddhist Kalinga kingdom of emperor Ashok, which had in the third century sent an embassy to Southeast Asia in an attempt to spread Buddhism through the region. The simple repeat patterns of eastern Indian cloths were superceded by cloths with distinct singular patterns often edges with a saw toothed flame pattern which came to be known as the tumpal in Indonesia. This flame pattern is de rigueur in the highly coveted and valuable woven temple silk saris of south India and was probably adopted from these sari borders and incorporated into the exported painted cloths to duplicate both value and appeal of the temple sari. The process of making the Coromandel cloths was laborious, as the cloth had to beaten several times to achieve a creamy smoothness conducive to the most detailed painting, a similar practice was later adopted by the better batik makers of West Java. The pattern makers drew in their patterns by hand onto stretched cloths, painstakingly, much as the Javanese batik makers would do years later. The patterns they procured were of two types, photographic positives if they painted in ink or dyes and photographic negatives if they painted in a dye resist substance such as mordant or wax. The splendid Palampores (deriving from the Indian word Palangposh meaning bedcover) of Masulipatam and later in-land Pulicat were of very large size used not so much for clothing (with the exception of the dodot), but for ceremonial hangings. They were finely detailed, patterned with trees of life and rich meander trellises in the style of European wall paper. By the time the Palampores made their way to Indonesia in the seventeenth and eighteenth century, an appetite for high quality Indian Chintz already existed in Europe. The Dutch in Indonesia imported vast quantities of Palampores for their own use because they so closely resembled the Coromandel cloths exported to Europe. Soon they spread throughout the archipelago finding favor with the local people as well. The dodot were oversized Coromandel cloths used by Javanese royalty as the 'clean' wraps over their Patola trousers. 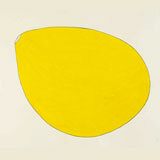 The dodots were extraordinarily fine, often with large diamond shaped center fields. The center fields of meandering flower vines were sometimes set off by complex geometric patchwork patterns. Some of the most spectacular cloths created were patchwork 'samplers' which incorporated different patches of different patterns. It is likely that these cloths were manufactured to imitate the Indonesian sewn patchwork talismanic jackets worn by the nobility in Sumatra and Java. A number of Kain Sembagi and Kain Lahore cloths were traded in Sumatra, directly for precious forest products. Some of them were embellished with gold paint, known as prada, by the local people to accentuate their beauty and value. Many of the cloths were fashioned into articles of clothing, specifically short jackets and long tunics known collectively as baju. Indian cloths were coveted by the people of South Sumatra in particular. As the region became progressively more Islamic, the cloths came to be looked at talismans of power achieving their greatest popularity in the nineteenth century mostly used as shoulder cloths. The Coromandel Coast also produced a unique set of figurative cloths showing specific scenes from the Hindu Ramayana epic. These cloths have been identified as teaching devices for the people of the eastern islands and were exported to Indonesia as early as the seventeenth century, well into the nineteenth century. The Calico cloths traded from the western Malabar Coast to Indonesia were coarse and plainer than the Coromandel cloths. Gujarati traders would often stop off at the port of Calicut en route to Indonesia loading up on Calicos. The Malabar Calicos were the least valuable of all cloths traded in Indonesia. The condition and quantity of Indian trade textiles found in Indonesia point to two facts. Indian cloths were not only used as articles of clothing, and that they were preserved very carefully through generations in relatively natural surroundings. The quantities of cloths sent to Indonesia and the documented evidence of purchase by the nobility and the wealthy confirm that Indian trade cloths played a very important role in the social and cultural life of the people. The Indonesians did not discriminate based so much on quality of the pieces but rather on the perceived spiritual value of the cloths. Exactly how the value was assigned or how much value it was, no one can say for sure, but there was a definite hierarchy among the imported textiles established throughout the islands which was surprisingly consistent. The Patolas stood at the top of the totem pole, the figurative ones followed by the florals, next came the Bengal muslins and the Coromandel outsized cloths used as ceremonial hangings and finally the coarse cottons of the Malabar Coast. Since Indian trade cloths were regarded as spiritually loaded works of art, they had to conform exactly to an established set of specific pattern rules, any deviation rendered the cloth valueless. There was very little secondary trade in Indian textiles between the countries of this region, because Indonesian buyers were not interested in Indian cloth manufactured for the Thai or Khmer markets as they were made to satisfy different aesthetic parameters than those demanded in Indonesia. Indian textiles were elevated to a higher status in Indonesia than they ever assumed in India, the country of origin. To Indonesians, the first Indian textiles must have seemed refined beyond comprehension. In addition, they represented the aesthetic parameters of Cambay, serving as evidence of a philosophy that was very attractive to the island people. The fact that some of the cloths exported were not of the highest quality did not seem to be of much concern to their foreign buyers. The custom of exchanging cloth to cement relationships and obtain land rites was very widely followed in Indonesia. Cloths were also extremely important in rites of passage such as deaths, births and marriages. Hence, naturally, when these seemingly complex cloths turned up in Indonesia, they became the benchmark for the highest value barter currency in circulation. Indian cloths were accorded the status of talismans and assumed a spiritual meaning for the people who purchased them, in many ways becoming most precious because they couldn't be duplicated in the host country. Indian cloths were not only heirlooms to be passed on from generation to generation, but also were repositories of wealth for their owners. They were protected as best the people knew how: through little wear and careful placement in the tallest rafters of the house away from mice and damp. In many instances, the cloths were divided so that they could be distributed equally amongst the children, in such cases, though the cloths lost a great deal of their aesthetic and resale value, they were believed to still possess most of their protective power. The buyers of the cloths were very discriminating in terms of patterns and their usage. In Java certain cloths could only be owned and worn by the nobility, while in Bali special cloths were believed to protect the wearer from harm during potentially risky ceremonies like tooth filing, a custom followed to this day. Indian trade cloths influenced every aspect of Indonesian society, on a broad basis determining land rights and providing safety during rites of passage. However their most lasting influence has been on the textiles of Indonesia from ikats to batik. Javanese batik was very influenced by the dye resist Kalamkaris of the Coromandel Coast. When the trade in Kain Sembagis and Kain Lahores dried up, the batik makers of Jambi in South Sumatra began to produce respectable imitations that soon became valuable in their own right. The batiks of Jambi were strongly blue and red echoing the colors of the Coromandel cloths and in many cases block-printed and hand resist painted like their Indian forebears. They also displayed tumpals along the edges. The influence of Indian trade cloths can be seen in the ikats of Indonesia, from the island of Bangka in the west right through to Roti in the east. Bangka weft ikats were very finely woven, not so much in the tradition of Patola cloths, but more capturing the floral meander patterns of the Masulipatam cloths. The single ikats of Roti played tribute to the Patola cloths, incorporating many Patola designs into the local weaving vocabulary. Some of the double ikat Gerinsing patterns woven in the village of Tenganan are also clearly inspired by Patola and like the Patola are also believed to have healing properties and protect the wearer from harm. Indian influence in every aspect of Indonesian life is vast. Clearly the Indian trade cloths contributed to the spread of Indian culture throughout the archipelago and cemented cultural ties between the two countries.